It looks like you’re confused whether you should start rearing broiler or layer in your poultry farming. So, you need a good guideline for the debate of layer vs. broiler farm in Bangladesh. If you have a passion for poultry farming and you are thinking of venturing into the profitable poultry business then we’ll succinctly outline the benefits, economic importance, and disadvantage. And you will end up choosing the one that seems more profitable to you at the end. That’s why it is ideal to appreciate the concept of whether broilers or layer profitable prior to moving farther. As they possess a strong gene, it makes them grow faster. However, broilers are poultry birds and usually, they rear for meat production. Layer vs. Broiler Farm: What are Broilers and Layers? Broiler chicken is usually known as a broiler, which rears solely for the purpose of meat production. As broilers or Broiler chickens are birds that rear solely for the purpose of meat production, their genes make them grow faster than native chickens and layers. And broilers can grow to attain heavyweights within few weeks. That’s why they can cause their vents to protrude out or make them cripple and unable to walk as a result of their excessive weight gain. Having excess energy to enable them to gain weight, the broilers feeds make it. On the other hand, purposing of egg production, someone rear layer birds. As if every chicken must lay an egg every day, they have genes that make them lay eggs often. And since layers tend not to gain weight, their feeds composition is made in such a way that it helps those lay eggs without much weight. 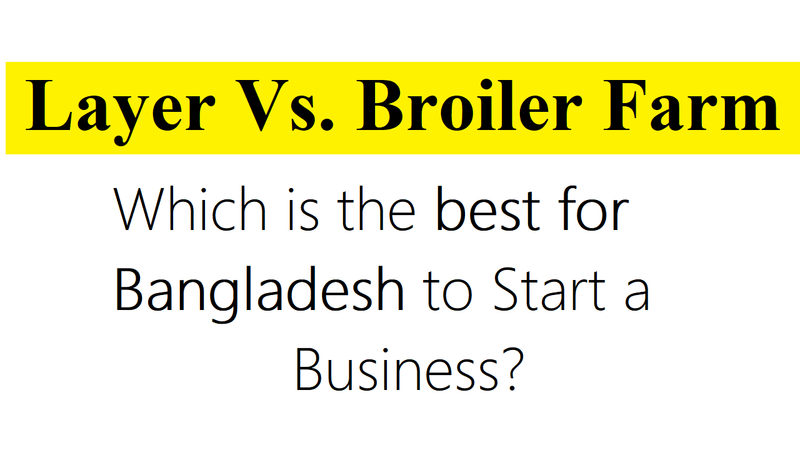 Now, let’s know some other comparison of layer vs. broiler farm that will make you an easy understanding of which one is the best for the context of Bangladesh. Although starting a poultry farming business requires much capital, to begin with, the less startup cost needs to start a broiler farming compare to layer as the initial costs. Also, in order to be ready to sell and you can start rearing another set, broilers need clean water, few vaccines, space, light, and food, within 7 weeks (roughly 2 months). On the other hand, layers require all that broilers take with multiple vaccines and debeaking. Identify your potential buyers if you have the interest in broiler farming. Also, know how much they could buy, what can hinder the market and what you could do to leverage the market. But, because the chickens will keep on consuming the feed whether you have a prospect to buy the chickens or you don’t, broilers are not too good to market. You’ll keep incurring a loss because irrespective of the excessive weight or how big the broilers are, in as much the broilers stay in your poultry without selling. It’s the thing that depends on the amount the customers are willing and able to pay. Otherwise, because the eggs the chicken’s products can be stored conveniently without getting spoilt while layers are easier to market. Without being desperate about it, you can decide to sell the eggs whenever you are willing. Also, when the layers will be fed every day, they will be laying eggs that you will get to distribute to your customers on a daily basis. However, the egg price in most region part of the world is preset, which is the main low to the layer marketing. And you’re bound to sell them at the same price other farmers do if your layer poultry farm produces a big egg. But, we’re sure that you should identify which is more profitable in term of marketing while looking at the marketing difference and disadvantage. You’ll lose some of your chickens and within 2-3 months when there is a disease outbreak. And then you need to rear another set of the broiler chickens as new. However, it’s reverse in case of layer farm business. It’s practically impossible to start another set of layers if a disease outbreak should occur to layers and some should die. And you’ll need to wait for closely a year to fully recover that the loss occurred. So, you should be able to determine which is more profitable, looking at it from this perspective, between broiler and layer. If you talk to immunization for broilers and layers then the amount of money you will spend while treating layers’ diseases will be more than that of broilers. This is because layers stay longer as such it requires more money to purchase their vaccines, drugs and other processes like debeaking. Also, it will reduce their egg size if there is a shortage of feed for the birds. And it affects layers’ egg production greatly, on the basis of infection or disease even down to debeaking. Moreover, while using coccidiosis to prevention or treatment of diseases it affects layers’ egg production as well. The layers can be sold as meat which this kind of opportunity is not available in the broiler. So, the layers farming will, in the end, bring in extra revenue after laying off eggs, which is not available from broilers farm. Also, layers should be sold and replace with new ones when they get old. And this is the time when the rate of their consumption is higher than that of egg production. But, if you know the ideal marketing strategy you are to adopt, the demand and challenges of the two before you begin then you can only determine which is more profitable between broiler and layer. There nothing rest for a conclusion as you already know Layer vs. Broiler farm from the above discussion. So, we can say that both broiler chicken layer production is a lucrative poultry farming business. But, a single mistake is enough to wipe your entire flock. It means that whichever you select, you must get well training and be very careful. That’s all.